I was wondering if anyone using an iPad with a Mono station could answer a quick question for me. 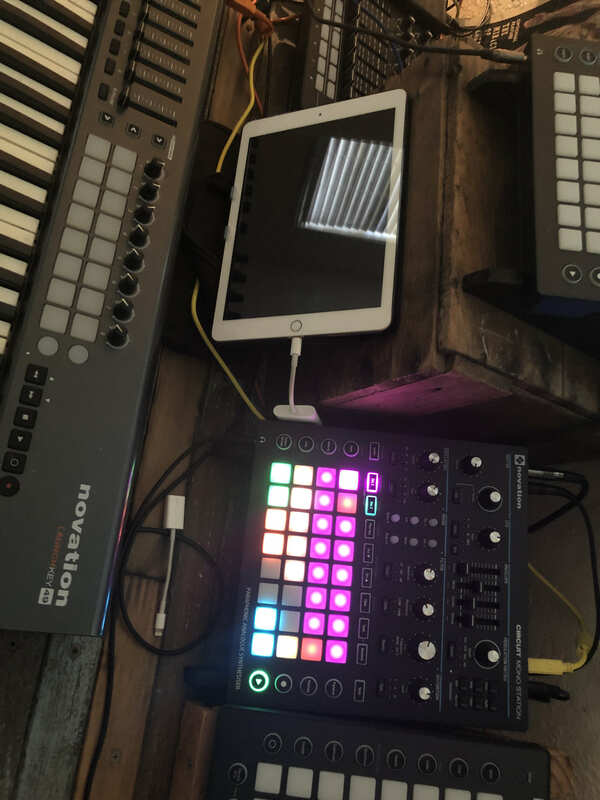 I am connecting the mono station via USB to an iPad. Does the monostation USB midi send midi information to the midi thru? Midi does transverse on USB both ways. Are u using aux cables for midi or usb only? Using amido Synth editor app? I heard back from novation and they told me that what I was experiencing was as designed. USB carries midi independently from the midi ports, so you can’t send midi to the midi thru port from USB. Thanks for your ideas Rust(i)k.
I have no problems when set up like in your image (direct USB connection). However, if I then connect Circuit to the Mono via the midi thru I can’t send midi notes or sync the Circuit. However, I have had success connecting multiple devices all using USB to the iPad, so I should be able to work it out that way. I heard back from novation and they told me that what I was experiencing was as designedly. USB carries midi independently from the midi ports, so you can’t send midi to the midi thru port from USB.